The conference is over. But the organisation part of it isn’t. There are accounts to be finalised and even now, still a lot of emails to answer. So let me digress to answer the most often asked question via email now: Conference proceedings will be posted on the website and you will all be emailed to be told when they get uploaded. But what else have I been up to? Well, I have had a particularly weird and busy time of it and a lot of it has involved writing. Amanda Curtin’s Elemental which will end up in the Bookworm (out 6 May) but possibly also in the Australian Book Review and then eventually vend its way to AWW 2013. The reason it works is because Amanda creates worlds. When you read Elemental, the worlds of the northern Scottish shores, of the Shetland Isles at the turn of the 20th century and of Fremantle, Western Australia during the Great Depression and the First World War come to life. Suddenly, you find yourself straddling the same time-space boundaries that Amanda leaps across in order to tell you the story. The places Amanda takes us into are the spaces where time is no longer linear and past, present and future happens all at once which makes you feel as if you are there, figuring out what is going on just as Meggie, her protagonist is. Elizabeth Manning Murphy’s Working Words for the Bookworm and eventually for the AWW 2013. 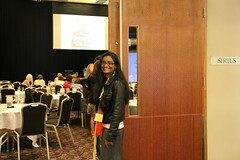 A conference wrap up post for Meanjin. Then Selena Hanet-Hutchins, due to speak on the future of editing and the gamification of the book, goes missing and I start looking for a misplaced speaker who I’m told looks like a geeky editor rather than a nerdy one. By the second day, the definition of what is a nerdy editor as opposed to a geeky one has been debated and defined over Twitter and the consensus is that it must be some sort of sliding scale where an editor wearing cardigans, owning cats and sipping tea is at the far end of the nerdy side. Knowing how to do anything technologically sends you towards the geeky side. Both sides are pedantic. A pre-conference post for Media Super. It is past midnight and I am sitting on the floor of Perth Train Station, my phone plugged into a power socket that previously powered the vending machine. I’m not biding time while I wait for my train; I am setting up the social media networks for the frenzy that will hit over 7000 people online in a few days’ time. 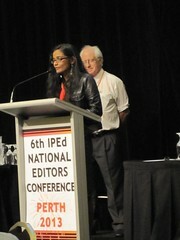 About two and a half years ago, I signed up to be the convenor for the 6th IPEd National Editors Conference. The Institute of Professional Editors holds a conference every two years for the editors in Australia and in 2011, the Society of Editors (WA) Inc, took over organising the Perth one for 2013. 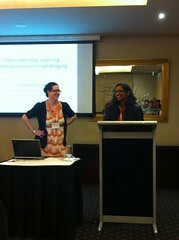 A conference wrap up for the Bookworm (6 May). We rediscovered how valuable we were in the Wednesday workshops. On the Thursday, we were bolstered by Nury Vittachi’s hilariously argued point that we can provide much need editorial help to the Asian region. Carmen Lawrence urged us to remember that we are part of the process of protecting and preserving our heritage and history. Selena Hanet-Hutchins asked us to not be afraid of the interactivity in digital publishing but to view it as a gaming experience for the reader. The blogging gods interrupted Katy McDevitt’s talk halfway through with a heavenly chorus causing much mirth though we later found out that heaven was really located next door in Kevin Price’s talk on children’s literature. A profile piece on Amanda Curtin for the Bookworm (6 May) but also possibly for the next Australian Book Review (it is currently sitting in their inbox). There are worlds on Amanda Curtin’s walls. It’s the first thing you notice when you walk into her studio – a converted storeroom at the back of an unassuming cottage on an equally unassuming street somewhere in Bassendean. Later on, I find out that it used to be a general store selling milk, bread and newspapers. Somehow, it doesn’t surprise me. An article on how to run away and join the circus which is sitting in Frankie magazine‘s email inbox. 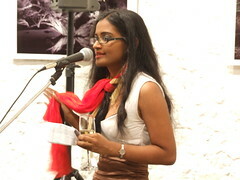 Anushka is a hooper – a perfomer working with hula hoops – working in the Sydney circus community. Her first impressions of what a circus was like came from the British literature she was exposed to growing up. It’s a long way from the animal tricks type of circus one immediately thinks of. Cirque du Soleil shows are an example of the modern circus industry – nouveau circus, where there are no animals due to animal cruelty laws and instead more pyrotechnics, more physical skills and acrobatics and a lot of glitter, glitz and glamour. If you do want to throw your hat into the ring, then the first thing you definitely do need is a desire to perform. Anushka can attest to this. A post on how to manage stress and keep calm for Katy McDevitt’s PublishEd Adelaide blog which will be up later this month. Calm. Oh dear. Calm, she says. Positive, she says. OK, Katy, let me tell you all about it then. The simple answer is that I have a few secret weapons. The first one has probably a lot to do with my past – not checkered but more almost surreal to the point that there are those staircases going everywhere and melting into each other like watches. That kind of past. A January to April round up editorial post of what we have been reading in the non-fiction genre for the Australian Women Writers Challenge 2013 which went up yesterday. So then what are we then when we come to being non-fiction readers, the little stable of regular reviewers that dabble in this genre? We seem to be interested in the past, particularly in matters of justice and perhaps we have a desire to set things right for we read voraciously about other writers and devour their work, their thoughts and their advice. Maybe we want to set things right and write wonderful books about the past as well or maybe we just want to dispense advice that we know the world needs or possibly divulge the contents of our head when it comes to that one subject that we seem to be one of the few experts in the world on. These are the books we gravitate to so do they reflect who we are? As the year goes on, will we reveal more about what kind of readers we are when we choose to play in the factual non-fictional end of the literary pool? A short story titled Before/After submitted to Meanjin on which we probably won’t hear back till Christmas, that being the height of their submissions pile. Now I feel sorry I hadn’t done it anyway because perhaps slightly, unnoticeable dents in the plastic would be better than glaring red swipes when it came to missing someone. In the Before I had thought to myself that perhaps he wanted pieces of me, pieces of him everywhere, our mark on everything because it was ours. And I liked it. I wanted to go around painting little red swipes and slashes on everything that was ours. Instead I restrained myself and wrote a minor character into my third that signed and scrawled her name in the oddest of places on the oddest of things and so ended up with a collection that was thought to belong to her instead. And also many lawsuits and disputes. 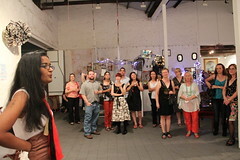 An article on the Meanjin blog about the Guys Read Gals project. M: How did you guys come together to work on this project? I set up the site and all the social media accounts and gave him his platform and the microphone basically. A video about the conference which you can view here, created by Richard Seale ofRichMedia who apparently is planning an outtakes clip as well. 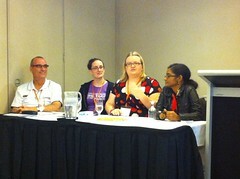 The Young Journalists panel at the Perth Mediapass Student Industry Day on 6 May, however it is now cancelled and they are hoping to re-schedule for later in the year and I have agreed to be on it again, whenever they end up having it so watch this space for more information. The May meeting for the Society of Editors (WA) Inc which is on 21 May at 7:30 pm at the Tom Dadour Centre in Subiaco, Perth. We will be discussing the “secret weapons” we use as editors to get the job done and it will be structured but informal. An article on HPV vaccination for Science Network WA. A immensely huge political background piece on the Wallis & Futuna Islands. An article on nouveau circus in WA. Reviews for about three or four books for AWW 2013. Another huge article on the NUS/Gonski funding issues IF I can find people to talk to me. Pretty pictures of moi (at least the latest ones if you really are keen) can be found here at the Society of Editors (WA) Inc’s Flickr group. Here are a few of them below. Most have been taken by Joey Faith Heng who is an awesome photographer.